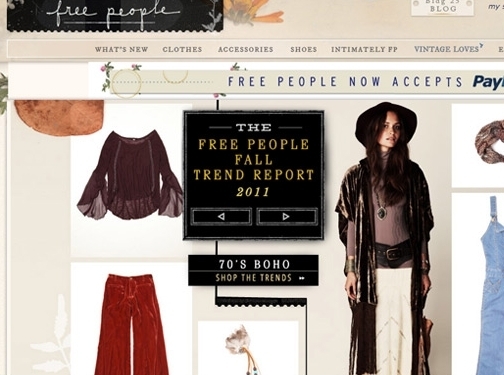 FreePeople carries the latest fashions for any season. Combinations are easy to put together on the FreePeople site. Shoppers looking to combine midi skirts with a peasant blouse can find dozens of pairings. Others looking to pair maxi dresses with vintage belts can find a unique selection unlike anywhere else on the web. Those looking for easy & breezy day dresses can find a handful of comfortable options that can be paired with wedge sandals. US (South Carolina) based company offering clothing and accessories for women. Website features full e-commerce facilities (including displaying items in your local currency automatically), blog, features area, and general info you will need to know when buying from a site (size chart, terms, shipping, returns etc). Headquarters address found under "contact us".